Supercritical geothermal resources located close to the transition between the brittle–ductile zone have been proven to exist at drillable depths. This was demonstrated by several deep geothermal drilling campaigns throughout the years, starting in the late 1970s. The interest in exploring supercritical resources is particularly strong, as it was revealed that one such well might significantly increase the production output and simultaneously decrease the need for drilling operations within a particular geothermal field. Deep drilling projects exploring supercritical resources such as these carried out in Iceland, Italy or Japan, where temperatures went significantly above the critical point and hostile geothermal fluids were produced, faced a variety of challenges during drilling operations and fluid production. The most critical of these exerted major thermally driven loads upon the cemented casing strings, leading to serious damages and eventually to well abandonment. This research presents an extensive literature search on failure modes of 20 wells from different high-enthalpy geothermal fields around the world, experiencing temperatures greater than the critical point of pure water and gives an overview of areas of improvements and potential solutions in regards to the drilling and well completion technology. Conventional hydrothermal geothermal wells with a depth of around 3000 m and temperatures of 340 °C can yield from 4 up to 10 MWe. Recent studies have proven that productivity might be increased by a factor of 10, if fluids from supercritical resources had been extracted (Friðleifsson et al. 2005, 2014a, b). This is due to the increased enthalpy, lower viscosity, and density of supercritical fluids that allow for much higher flow rates. The longevity of a geothermal well drilled into the supercritical resource depends significantly on the appropriate drilling and well completion technology. Deep and high-temperature drilling projects in countries such as Iceland, Italy, Kenya, Japan, Greece, USA, and Mexico have all reached critical temperatures and encountered, in the majority, highly corrosive and hostile fluids. Such extreme reservoir conditions promoted damage to the casing material, cement sheaths, surface equipment, and led to serious well failures and in many cases to well abandonment. These drilling campaigns created an acute need for improvements in drilling and well completion technologies being currently used for high-temperature wells. It is worth emphasizing, at this point, the great ambiguity of terms ‘supercritical’, ‘superheated’ and ‘super-hot’ geothermal resources. Up to this date, there is no clear definition available of what is considered as ‘supercritical’ or ‘super-hot’ geothermal resource. In the Oxford English Dictionary, word ‘supercritical’ is described as ‘relating to or denoting a fluid at a temperature and pressure greater than its critical temperature and pressure’; whereas, the Academic Press Dictionary of Science and Technology explains the word ‘supercritical’ as ‘the mobile phase of a substance intermediate between liquid and vapor, maintained at a temperature greater than its critical point’. It can be seen, that depending on the source, ‘supercritical’ fluids might be regarded as exceeding critical temperature only or simultaneously exceeding critical pressure and temperature. This proves the great ambiguity of a ‘supercritical’ geothermal resource and its confusion within the scientific world. To assume drilling into supercritical resources, one must always consider the chemical composition of the reservoir fluids present. The critical temperature and pressure increase significantly with salinity, transferring the supercritical conditions to much greater depths. The critical point of pure water is achieved at 374 °C and 221 bars and assuming boiling conditions starting from the well surface, corresponds to a drilling depth of 3500 m, as presented in Fig. 1. The critical point of seawater, i.e., 3.5% NaCl as indicated by Bischoff and Rosenbauer (1984) is reached at 405 °C and 302 bars and corresponds to a depth of approximately 5300 m assuming boiling conditions starting from the well surface. In the case of a geothermal reservoir with low or non-existent vertical permeability, pressure conditions may be governed by the hydrostatic pressure of a cold water column only, or by the lithostatic pressure, so that the critical pressure of the fluid will be reached at a depth of approximately 2300 m or at 3000 m assuming seawater salinity (Elders et al. 2014). This phenomenon is confirmed by the existence of black smokers (i.e., hydrothermal vents) in the rift zones at the bottom of oceans expelling fluids at temperatures exceeding 400 °C without boiling conditions occurring (Bischoff et al. 1984). Other researchers underline the significant influence of reservoir permeability and its great value to the amount of energy and volume of fluid that can be extracted from the geothermal resource. According to Scott et al. (2015), supercritical resources are those areas of a geothermal system, where reservoir permeability is higher than 10−16 m2 as well as the specific enthalpy and the temperature of water are greater than its critical point. Such definition avoids including pressure as a criterion for a supercritical resource and applies no distinction between ‘superheated’ (i.e., pressure conditions below critical point) and ‘supercritical’ (i.e., pressure conditions above critical point) resources. This explanation seems to be the most accurate, as currently there are no commercial geothermal fields that produce pure water only; thus, the pressure of 221 bars is not a very relevant criterion. Out of 20 drilling ventures mentioned in this research, only a few simultaneously reached and confirmed pressure and temperature of the geothermal fluid present higher than its critical point, i.e., the recent IDDP-2 well in Reykjanes (Iceland) and the Venelle-2 drilling venture in southern Tuscany (Italy). For instance, the well IID-14 in the Salton Sea Geothermal Field (USA) reached a temperature of 390 °C, which is several hundred degrees Celsius lower than that of any supercritical brine that could be present in that field with a total amount of dissolved fluids of approximately 25,000 mg/kg (Elders and Sass 1988; Ross 1991). Even greater ambiguity concerns the ‘super-hot’ geothermal resources. This term has been used in the projects such as GEMex,1 where ‘super-hot geothermal systems’ are regarded as geothermal wells experiencing ambient temperatures higher than 380 °C, and the planned Newberry Deep Drilling Project (NDDP) where ‘super-hot’ resources were regarded as geothermal wells with temperatures higher than 400 °C (Cladouhos et al. 2018). Similarly to ‘supercritical’ resources, ‘super-hot’ resources do not have a clear definition within the scientific community and remain ambiguous. To make some generalization to the drilling projects being revised in this paper and due to the lack of solid information regarding reservoir permeability, measured downhole pressure conditions and chemical composition of the reservoir fluid present of the particular geothermal fields being investigated, authors will consider criterion of a critical temperature of the pure water only for determining a supercritical geothermal resource. A failure mode is regarded as any kind of damage to the downhole construction (e.g., casing strings, cement sheath) and/or surface equipment (e.g., wellhead) of a geothermal well that either temporarily excludes further drilling operations, well testing or fluid production, or leads directly to the partial or total well abandonment. All of the geothermal wells drilled into extremely high temperatures push their components including casing strings, casing connections, wellhead assembly, cement sheaths, drilling fluid to its technical limits. Based on the classification of casing failures made by Teodoriu (2015), excluding casing failure from corrosion, extensive wear, and overloading, most wells investigating high-temperature geothermal resources will fall into the category of the so-called temperature variation induced fatigue. This kind of failure is caused by large temperature variations and is aggravated by the lack of casing mobility within the cement sheaths. It is expected that such casing failure will be caused by accumulated temperature cycles, putting the casing material above its yield limit. Similarly to the casing material and connections, fatigue due to extensive thermally driven loads will lead to cement sheaths damage and loss of the cement bond at casing–cement or cement–rock interfaces with potential influx of hostile reservoir fluids. Geothermal wells may be categorized based on the ambient well temperatures (Böðvarsson 1961) into low temperature with less than 150 °C at 1000 m, medium temperature between 150 and 200 °C at 1000 m and high temperature with conditions equal or higher than 200 °C at 1000 m. There has been, however, an increasing number of boreholes, drilled in the conditions greatly exceeding this categorization, with multiple wells reaching resources with temperatures close to or exceeding the critical temperatures of pure water. Figure 2 represents the relation between reservoir pressure and temperature of selected geothermal wells from different high-enthalpy locations worldwide, which are close to or exceeded supercritical conditions of pure (blue line) or sea water (red line). It can be seen that only a few wells have exceeded simultaneously critical temperatures and pressures. It is worth mentioning that different temperature measuring techniques were applied depending on the reservoir conditions and, at the time, available logging equipment and methods. For instance, temperature in the IDDP-2 well in the Reykajnes geothermal field (Iceland) was measured using the wire-line technology near the well bottom; whereas in the IDDP-1 well in the Krafla geothermal field (Iceland), temperature was measured during well discharge operations at the well surface and in the WD-1A well in the Kakkonda geothermal field (Japan) temperature was measured, amongst other methods, using melting points of pure tellurium metal lowered into the well. The casing program is the most crucial feature that influences successful drilling operations and the longevity of the future geothermal fluid production. It implies assessing casing setting depths, a number of casing strings, nominal casing weight, casing material, type of connections and well completion. The main functions of casing programs are preventing casing deformation, supporting blow-out preventers and permanent wellhead, containing drilling and production fluids, preventing groundwater contamination, mitigating drilling fluid losses, protecting wells from corrosion, fracturing and erosion, preventing inter-zonal cross-contamination of geothermal fluids, defining a production zone and providing access to the reservoir (New Zealand Standard 2015). Conventional high-temperature (also called high-enthalpy) geothermal wells consist usually of three–four cemented casing strings. The typical casing program for most geothermal wells incorporates a conductor pipe, a surface casing, an intermediate casing which may serve as an anchor casing (i.e., casing string to which wellhead is attached), a production casing and an optional perforated liner (holed or slotted). All of these casing strings mentioned are cemented from casing shoe to top of casing string to prevent corrosion resulting from migration of reservoir fluids and to control thermal expansion during fluid production. A liner pipe, which is either suspended from a liner hanger or set at the well bottom, is usually left uncemented in the production section of the well. The completion is finalized by assembling a permanent wellhead at the top of the well. In most cases, it includes an expansion spool placed directly below the first master valve, which allows for expansion of the uppermost parts of the production casing string with respect to the anchor casing to which the permanent wellhead is attached. No reliable and well-established methods and criteria for well design are yet available for wells with temperatures close to or exceeding the critical point for pure water. The New Zealand Code of Practice for Deep Geothermal Wells from 2015 covers geothermal well design with an account of material strength reduction for well temperatures only up to 350 °C (Karlsson 1978) and production of non-corrosive geothermal fluids. Such temperatures, as previously demonstrated, have already been exceeded in multiple super-hot locations around the world and in many cases, the produced fluids were highly corrosive and acidic. Up to this date, no research has focused exclusively on drilling and well completion aspects of geothermal wells exploring supercritical resources. This paper is a follow-up and extension of the work carried out by Reinsch et al. (2017) focusing on current research efforts and potential opportunities that supercritical geothermal resources might provide for an international collaboration as well as presenting a list of past supercritical drilling ventures. Authors strongly believe that a thorough investigation of previous case scenarios and their challenges, as carried out in this paper, will be crucial to harness thermal energy from the supercritical geothermal reservoirs in the safest possible manner in the future. The paper is divided into three distinguishable sections. The first section presents an overview of the recently undertaken international initiatives for exploring supercritical geothermal resources together with their main goals. The second section gives a detailed review of well histories together with the description of failures being encountered. The third section of the paper presents authors’ recommendations and already implemented improvements of the current drilling and completion technology being used for drilling high-temperature wells used worldwide in order to safely and more efficiently harness supercritical geothermal resources. Supercritical geothermal resources are currently being investigated in many areas worldwide within joint international programs, driven mostly by the European initiatives. A brief description of such programs is presented below. The GEMex project is a collaboration between a European and a Mexican consortium with the main aim being to promote the potential utilization of unconventional geothermal resources such as the Enhanced (EGS) and Super-hot Geothermal Systems (SHGS) in Mexico. Super-hot geothermal resources are being investigated below the current production reservoirs of the Los Humeros geothermal field with the hottest wells experiencing well ambient temperatures of 395 °C and producing hostile reservoir fluids. The EGS concept is being explored at the Acoculco volcanic complex, where two exploratory dry wells were drilled to a total depth of 2000 m with high temperatures of approximately 300 °C. DESCRAMBLE2 was an international drilling project aiming to investigate supercritical resources within the Larderello geothermal field in southern Tuscany (Italy). The main goal of the project was to drill into a supercritical geothermal resource, test and demonstrate new drilling techniques, control gas emissions, high temperatures and pressures expected from deep geothermal reservoir as well as to characterize their chemical and thermo-physical conditions. The recently finished Venelle-2 well achieved temperatures of more than 500 °C at a well depth of 2810 m measured using various techniques. The aim of the DEEPEGS3 project is to demonstrate the feasibility of EGS for delivering energy from renewable resources within Europe. Drilling of the IDDP-2 well in south–west Iceland was the first step to investigate such unconventional resources. The IDDP-2 well was able to go beyond critical pressure and temperature of saline geothermal waters of the Reykjanes reservoir and achieved a temperature of 427 °C at depth of approximately 4600 m and perform the deepest primary reverse cementation in Iceland and one of the deepest in the world at approximately 3000 m of depth. The IDDP-2 well is currently the deepest and hottest well in Iceland. Production tests are scheduled for the first quarter of 2019. The main objective of the Japan Beyond Brittle Project (JBBP) is to demonstrate enhanced geothermal energy extraction through the scientific understanding of various phenomena in the brittle–ductile transition. This research was preceded by the initial deep drilling of the WD-1A geothermal well conducted at the Kakkonda geothermal field between 1994 and 1995, which have proven very low permeability. Drilling operations were eventually withheld due to safety reasons and possible gas ejection (Asanuma et al. 2015). This section describes histories of high-enthalpy geothermal wells in different super-hot locations worldwide with reservoir temperatures exceeding the critical point of pure water, which have experienced one or more failures modes. Detailed technical specification of presented wells (i.e., date of drilling, final depth, temperature and pressure conditions, logging methods and failure modes) are presented in Table 1, together with their casing programs and parameters such as casing setting depths, casing materials, nominal weights and types of casing connections. The Nisyros-1 wildcat well was drilled in 1982 on the Greek island of Nisyros to the final depth of 1816 m. A temperature of approximately 400 °C was measured directly on the wellhead assembly. Production from Nisyros-1 was carried out from two zones, with a deeper one containing brines of very high salinity of approximately 100 g/kg of total dissolved solids. Casing design process was performed assuming formation temperatures being equal to boiling curves of 10–25% NaCl brines. After performing the first production tests, the 9 5/8″ production casing was seriously damaged at six different intervals between a depth of approximately 150 and 1240 m and plugged with scale deposits. It is worth to mention that no treatment other than circulating drilling fluid was done, before placing and cementing to mitigate circulation losses. Due to the buckled sections of the casing, collapsed areas were re-drilled with a milling assembly and a remedial 7″ tie-back casing was placed to a depth of 1258 m. During the next production tests, the newly installed 7″ tie-back casing also experienced casing collapse and buckling (Chiotis and Vrellis 1995). These two cases of casing failure can be explained by fast heating during initial production tests and fast cooling during well killing operations with cold water exerting extremely high thermal loads upon cemented casing strings. The casing failures are also likely to be associated with bad primary cementing operations which might have been caused by rock fracturing and corrosion resulted from highly saline reservoir fluids (personal communication with Dimitrios Mendrinos). It was concluded from the chemical composition of the productive horizons that high overpressures exist at shallow as well as greater depths, resulting in a high probability of a blow-out. The Nisyros-2 well, drilled in the close vicinity to the Nisyros-1 well, did not experienced casing collapse, which can be explained by the experience gained in this area and changes to the well design including implemention of steel with higher yield strength (Geothermica Italiana 1983, 1984; Mendrinos et al. 2010). The NJ-11 well in the Nesjavellir geothermal field was drilled in 1985 to a final depth of 2265 m. During drilling operations, multiple overpressurized feed zones were encountered which later resulted in circulation gain and wellhead pressure rise of 5–6 bars after circulation ceased. First fluid losses and main feed zone were found at a depth of 1226 m. Immediately after drilling, geothermal fluids with a flow rate of 35 l/s, flowed up the annulus between casing and drill string. This rather unexpected incident had to be quenched with cold water. After a temperature survey, accompanied with pumping 44 l/s of cold water into the well, interzonal flow and possible underground blow-out conditions occurred. It was observed that potentially supercritical fluids, with pressures above 220 bars and temperatures of more than 380 °C were entering the main feed zone at 1226 m. High temperatures damaged the float valve in the drill string and fluid leakage was observed on top of the lubricator at the wellhead assembly. Controlling the well after drilling operations with cold water proved to be immensely difficult and unsuccessful. The NJ-11 well was partially abandoned by inserting a 200 m plug made from gravel and the well was eventually completed with a slotted liner down to the top of the gravel plug. The well was later produced from upper aquifers (Steingrimsson et al. 1986). The experience gained from the NJ-11 well led to the creation of the Iceland Deep Drilling Project (IDDP) to further investigate supercritical geothermal fluids. The location of the NJ-11 well is currently being considered as a prospect for the third IDDP deep drilling campaign. The KJ-39 well was drilled directionally to a final depth of 2865 m in the Krafla geothermal field in northern Iceland in 2008. Recovery of cuttings amounted to 100% from drilling to 1400 m and became partial between depths of 1400 and 2650 m. In deeper well sections, total circulation losses were experienced. After reaching the target depth, the drill string got stuck for a week and had to be freed with use of explosives. Once the drill string was retrieved from the well, the lower units of the bottom hole assembly contained of up to 30% of freshly quenched glass, indicating drilling into magma. The ambient well temperature of approximately 386 °C was measured using a wire-line logging tool at a depth of 2822 m, indicating supercritical temperatures. Eventually, the lower part of the K-39 well was sealed off with a cement plug, due to the possible threats of the lower zone being highly acidic, causing potential well damage (Mortensen et al. 2010; Árnadóttir et al. 2009). After retrieving parts of the liner pipe from the well, heavy corrosion was observed (Fig. 3). The construction of the KJ-39 well proved to be incapable of withstanding the conditions anticipated from a deeper and much more powerful aquifer (Einarsson et al. 2010). Pressure measurements from deeper well sections are unavailable. In August 2013, the KJ-39 well was turned into an injection well within the Krafla geothermal field (personal communication with Egill Juliusson). The main aim of the first experiment of the IDDP in the Krafla geothermal field in northern Iceland was to drill to a final depth of 4500 m, in order to produce from supercritical geothermal resources. 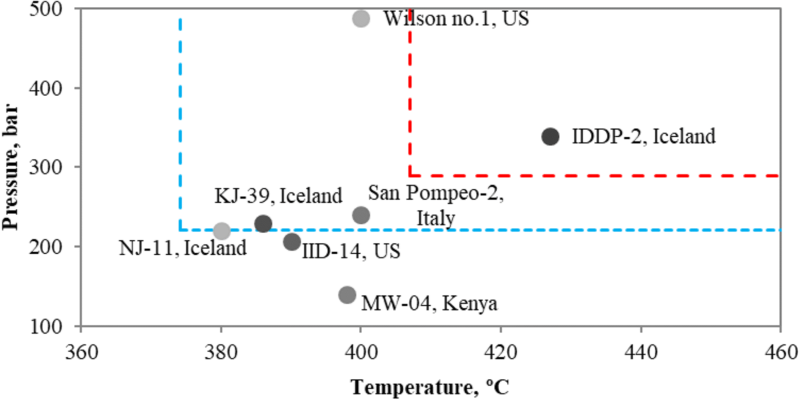 The IDDP-1 well was designed specifically to be capable of handling the extreme temperature and pressure conditions, which wells NJ-11 and KJ-39 were not able to withstand (Þórhallsson et al. 2003, 2010). Drilling of the IDDP-1 well was performed without major problems up to 2000 m and proved to be extremely challenging after reaching that depth with multiple loss circulation zones, a failed coring attempt, stuck pipe4 incidents due to drilling into rhyolite magma that required multiple side-tracking and created obstacles during the primary cementing operation. The cementing job of an anchor casing failed mainly due to the total circulation losses. After a cement bond log (CBL) tool was run, 200 m of a void in the cement sheath was discovered, between depths of 1410 and 1600 m. An inflatable packer, used primarily to cement sacrificial production casing, failed to keep sufficient pressures and reverse balance cementing job had to be performed. The IDDP-1 well was eventually completed at 2072 m with a final well depth of 2104 m. The maximum temperatures measured at the wellhead assembly amounted to 450 °C with a pressure of 142 bars, making the IDDP-1, the hottest geothermal well in Iceland and one of the hottest wells in the world (Pálsson et al. 2014). 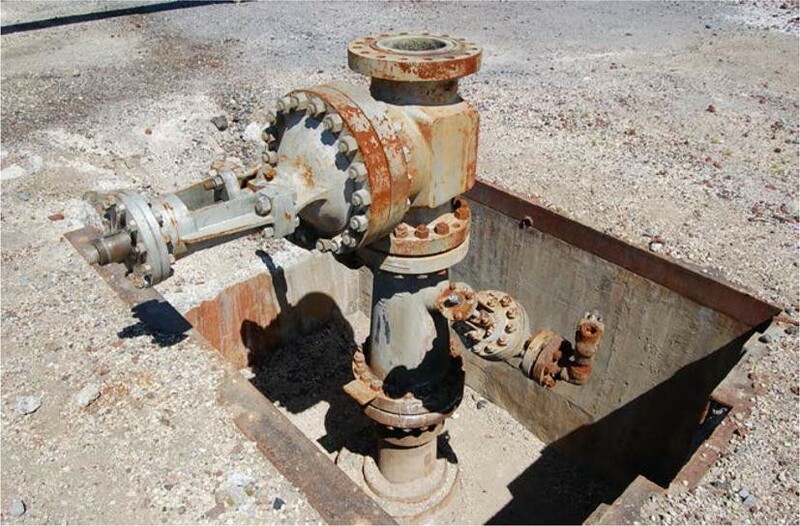 After a period of extensive flow testing, the well had to be quenched with cold water due to the malfunction of two master valves at the well surface, and further testing was terminated. Even with rather slow and careful killing, thermal stresses, exerted upon sacrificial casing were significantly high and the casing experienced collapse at two sections below 600 m, with possible other at deeper well sections, and casing couplings rupture. Other problems experienced were corrosion of casing material, extensive scaling (especially visible in the surface equipment as presented in Fig. 4), erosion and eccentric casing. The IDDP-1 well was eventually abandoned (Friðleifsson et al. 2014a, b; Ingason et al. 2014). There is a proposal to further investigate the magma encountered in the IDDP-1 well by the Krafla Magma Testbed5 (KMT) project which aims to characterize the physical, chemical, and mechanical properties of the interval between the hydrothermal system and magma and possibly develop methods of heat extraction directly from a magma source. Drilling operation for the second IDDP well started in the beginning of August 2016 with deepening of an existing 2500 m deep production RN-15 well located in the Reykjanes geothermal field in south–west Iceland. The RN-15 was a mere vertical production well with a 13 3/8″ production casing string cemented down to 794 m and an open hole completion. Drilling of the IDDP-2 well was carried out ‘blind’, i.e., without any drilling fluid returns with an exception of an interval of around 180 m after completed primary cementing operation of an anchor casing at 2941 m depth. Losses of drilling fluid could not be cured with loss circulation material (i.e., polymer pills) nor with multiple cement plugs performed through drill bit as well as through drillable fiber cementing strings. Multiple challenges occurred during drilling operations including weather delays, problems with hole instability that required multiple reaming jobs as well as stuck pipe incidents. The IDDP-2 well was cemented using reverse circulation method, due to total fluid losses and achieved satisfactory results. As of today, the IDDP-2 well has the deepest cemented casing in any geothermal well in Iceland. 13 core runs were attempted with rather poor core recovery using an impregnated 8½″ diamond core bit and perfect core recovery of nearly 100% with a 6″ PDC core bit beneath the liner pipe. Poor core recovery in the IDDP-2 well might be explained by fill-in at the bottom of the well, inclination, heavy dog legs, thermal fracturing of the rock formations as well as the diameter of core barrel being wider than the diameter of heavyweight drill pipe. The IDDP-2 well was finished at a depth of 4659 m in mid-December 2016 and the perforated liner pipe was lowered to a well depth of 4572 m. At the end of drilling operations, an additional sacrificial 7″ casing was set to a depth of 1300 m and cemented. Logging program, including temperature, pressure, and injectivity measurements, was carried out after 6 days of partial heating up. It was confirmed that the IDDP-2 well successfully penetrated the supercritical conditions of the geothermal brines in the Reykjanes geothermal system with 427 °C and 340 bars of pressure. The main feed zones of the IDDP-2 well were estimated at depths of 3360 m, 4200 m, 4370 m and 4550 m (Friðleifsson and Elders 2017; Friðleifsson et al. 2017). Right after the drilling operation ceased, an 3½″ injection string was lowered close to the well bottom and a 5-months stimulation operation with cold water pumping started. In May 2017, temperature logs were carried out after few days of heating up and confirmed bottom hole temperature of approximately 535 °C. After well stimulation, an attempt was made to seal off the main feed zone at 3400 m using biodegradable polymers. Unexpectedly, material totally blocked the well from downflowing and cooling was no longer possible. This resulted in week-long heating up of the production casing string and a serious casing damage between 2307 and 2380 m of well depth was discovered using wire-line logs. After retrieving the stimulation string, corrosion of latter assembly sections was observed. Currently, preparation for production tests is ongoing with the first flow tests planned for the first quarter of 2019 (iddp.com). The San Pompeo 2 exploration well was drilled in 1979 to identify the deep production zones down to the 3000 m reflector. The operations were carried out with a total loss of circulation starting from a depth of 836 m to the bottom of the well. Any attempt of plugging the rock formation fractures to stop circulation loss during drilling proved to be unsuccessful. Several drill string failures occurred while drilling, mainly due to corrosion from hydrogen expelled from the reservoir. During drilling at a depth of 2930 m, a violent hydrogen gas explosion was experienced. After the blow-out, well collapsed and only the first 2560 m of the well depth was accessible for further testing due to rock debris left at the well bottom. The San Pompeo 2 well experienced another similar blow-out incident right after drilling operations restarted. Samples from deep geothermal fluids proved the presence of hostile gases and strongly corrosive environment (Barbier 1984). Temperature and pressure conditions proved the presence of a superheated geothermal resource, i.e., 394 °C and 212 bars at 2560 m of depth. The materials as well as drilling and production procedures available at the time of drilling were considered not suitable for such harsh downhole conditions and the San Pompeo 2 well was eventually abandoned. The Sasso-22 exploration drilling well in the Larderello field was completed in 1980 at a final depth of 4094 m with a total loss of circulation from a depth of 608 m onwards, mainly due to numerous large and unsealable fractures and cavities. The rock formations drilled were extremely hard and nonhomogenous making drilling significantly difficult. A lack of drilling fluid returns forced the drilling team to use water with viscous plugs and implementing a less stiff drill string without stabilizers to prevent drill bit blocking during drilling operations. This phenomenon resulted in significant difficulties in keeping the well straight. The main problems occurred below 3000 m due to breakage of the steel drill pipes, possibly related to high temperatures and the highly corrosive nature of reservoir fluids. The primary cementing operation of the 9 5/8″ production casing could not be achieved with a stinger string and had to be performed through casing perforations using squeezing techniques. Due to extremely high well temperatures reaching approximately 380 °C at depth of 3970 m, measured using wire-line logging, explosives or hydraulic fishing6 tools such as jars could not be used. Pumping cold water into the well proved to be efficient and helped to free the drill string. Side-tracking with cement plugs was attempted to continue drilling; however, cement could not be placed at the bottom of the well for centering the whipstock equipment. The main reason for mentioned failures can be explained by the extremely high and uncontrollable reservoir temperatures. After three side-track attempts, the 9 5/8″ production casing was in very poor condition and decision was made to abandon the well soon after drilling operations ceased (Bertini 1980). Further analysis has shown that stress corrosion of casing material was aggravated with the steam condensates from a geothermal plant as a drilling fluid (Baron and Ungemach 1980). The San Vito-1 well was drilled in 1980 without any major challenges up to 2000 m depth due to the experience already gained from the other three high-temperature drilling projects in the Mofete field. The first fishing job at 2330 m resulted in some parts of equipment left inside the wellbore. The well was side-tracked just below the 9 5/8″ production casing. Mud gelling and coagulation was experienced at 2488 m. An attempt of freeing the drill string with explosive materials failed due to high temperatures decomposing the explosive charges. Another attempt of side-tracking the well with coil tubing also failed and another ‘fish’ was left inside the hole. A back-off fishing procedure proved to be successful at 2013 m; however, around 400 m of drill string was left at the well bottom. Drilling was later continued to 3045 m and completed at the same depth with slotted liner pipe. At 2500 m, only the melting of zinc samples was successful in registering well temperatures of about 419 °C. Production tests were attempted; however, the well showed a rapid increase of temperature at the wellhead, which was not rated for temperatures in excess of 300 °C. The San Vito-1 well was eventually killed (Baron and Ungemach 1980). Later analysis from purge test results proved that reservoir fluid from the San Vito-1 well had a pH level of 3.2 (De Vito et al. 1989) proving aggressive downhole environment. The Venelle-2 well is a directional exploratory well re-drilled from one of the existing dry wells with a total depth of 2200 m and reaching temperatures of approximately 350 °C, within the Lardarello Geothermal field in southern Tuscany in the close vicinity to the San Pompeo 2 well. The spudding operation began in the late August of 2017. The main aim of the project was to drill into the ‘K-horizon’ (i.e., an important seismic marker discovered from other deep drilling ventures in the area) located at depths of around 3000 m and reach supercritical geothermal resources. No production plans were made. During drilling operations, problems with partial and total circulation losses were experienced. 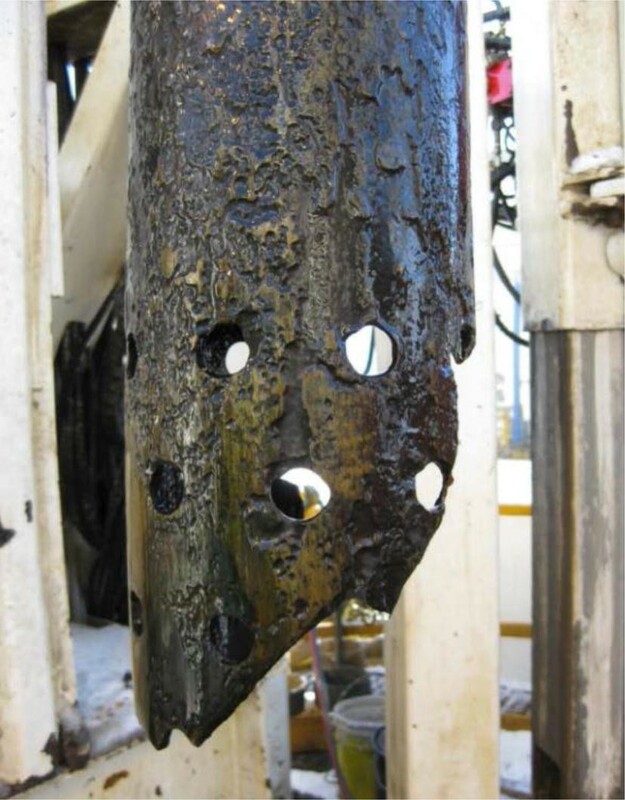 One of the main challenges during drilling of the Venelle-2 well was unexpectedly high pressures, encountered before reaching the target depths, which caused blow-out and eruption of tourmaline-quartz breccia and vein fragments. During cementing of a 7″ casing section, unexpected fire occurred around the well site and cementing was interrupted causing failure of casing equipment and slurry entry to the casing. The logging campaign performed after cementing operations proved large voids in cement sheath. The non-cemented sections at depth of 1205 m were cut off, while partially cemented sections between depths of 1205 and 1409 m were milled. Serious problems occurred during circulation stops with high density drilling fluid (1500 kg/m3), which increased significantly wellhead pressure and caused problems while implementing standard well control procedures. The first stuck pipe incident occurred at a depth of 2695 m, which was attempted to release using firstly jarring and pulling up the drill string assembly and later by the decrease of drilling fluid density to 1350 kg/m3. Problems with stuck pipe and circulation losses persisted and the well was eventually displaced with water in order to decrease well pressure and drilling fluid losses. Lower fluid pressures emphasized the need for reassessing well control and methods of circulation loss reduction using various squeezing and clogging techniques, which later proved to be unsuccessful. Challenges also occurred with setting up a swellable packer at greater depths in order to perform leak-off tests. Registering reliable temperature measurement was a serious issue in the Venelle-2 venture, where multiple temperature logging tools and methods were exercised at various drilling depths. Static formation temperatures of 504 °C at a depth of 2815 m and between 507 and 517 °C at a depth of 2894 m were established from available logging tools. The Venelle-2 well is currently temporarily abandoned with multiple cement plugs (Bretani et al. 2018). The WD-1A exploration drilling project in the Kakkonda geothermal field in 1994 was planned to reach a well depth of 4000 m. At depth of around 3450 m, problems with deterioration of drilling fluid properties evolved. This was caused mainly due to the rapidly increasing temperature gradient. Additionally, high contents of CO2 and H2S were registered in the drilling fluid returns. Higher-density fluid was needed to control the harmful gases. Unfortunately, higher temperatures prevented further drilling and operations terminated at 3729 m of drilling depth, due to safety concerns. The well was eventually completed to 2546 m with 1183 m of open hole section. The maximum measured temperature using melting alloys was approximately 500 °C at depths below 3500 m. Full logging scheme was performed, after which the well was plugged at 2400 m with plans for future re-drilling and side-tracking (Saito et al. 1998). No sufficient data were found regarding well failures in geothermal wells of the Menegai geothermal field. The main challenges experienced during drilling of high-temperature wells in that area were incidents of stuck pipe between well depths of 2100 m and 2200 m, where magma was encountered. Drilling of the MW-01 well was performed with partial and total circulation losses. The drill string got stuck at the end of drilling at 2206 m (Makuk 2013; Mbia 2014). During drilling the MW-03 well, the similar situation occurred at depths of 1187 and 2112 m. The well MW-04 yielded cuttings of freshly quenched volcanic glass at a depth of 2080 m. Drilling close to this magma resulted in problems such as stuck pipe at 2117 m and the drill bit damages, due to extremely high temperatures. After unsuccessful fishing operations, around 20 m of bottom hole assembly, composed of a drill bit, sub, stabilizer, and two drill collars was abandoned inside the well. The completion was carried out with a slotted liner above the ‘fish’. At final depth, rather low permeability values were encountered. Only intermittent and partial losses were experienced at the deepest well sections and no serious circulation loss problems were encountered (Mbia 2014). The MW-06 well (also called MW-05) yielded freshly quenched volcanic glassy cuttings at a depth of 2172 m. Drilling in the close vicinity to magma resulted in challenges such as stuck pipe at 2203 m. Similarly, as in MW-04, the bottom hole assembly with the length of 21 m, composed of a drill bit, sub and two drill collars was left in the wellbore and the borehole was completed with a slotted liner above the ‘fish’ (Makuk 2013; Mibei 2012). The H-43 well (Fig. 5) is an acid and superheated well, drilled between 2007 and 2008, in the northern part of the Los Humeros geothermal field located at the eastern edge of the Trans-Mexican volcanic belt. This well was drilled with bentonitic drilling fluid at all times, which masked potentially permeable zones. After washing operations, permeability was observed at a depth of 1890 m (Luviano et al. 2015). The maximum ambient well temperature measured using wire-line in the well amounted to approximately 395 °C (Pulido 2008). The H-43 well was producing hostile to the mechanical infrastructure superheated steam with a presence of the gaseous HCl and H3BO3. The wellhead temperatures amounted up to 285 °C and wellhead pressure to approximately 40 bars (Gutiérrez Negrín and Viggiano Guerra 1990). In order to enable safe fluid production, the well was attempted to be produced under superheated conditions, so HCl would remain in dry conditions, preventing corrosion of downhole as well as surface equipment. Other challenges included erosion from powerful superheated steam and extensive precipitation (Diez et al. 2015). Similar conditions as in the H-43 well were encountered in at least seven wells drilled in the field throughout the 1980s (Castro 1996), which were eventually abandoned due to the corrosion of the mechanical construction of the well resulting from the hostile geothermal brines with a presence of gaseous HCl (Diez et al. 2015). The development of technologies for further utilization of unconventional geothermal resources from the Los Humeros geothermal field below current production reservoir is at the moment being studied within the GEMex project. The Wilson no. 1 is a wildcat well drilled to a final depth of 3672 m in 1981 at the Geysers geothermal field. At the end of drilling operations, steam entry was registered near the well bottom with pressures rising up to 94 bars and high amounts of harmful gases such as CO2 and H2S. A casing collapse was registered in two places in an interval between depths of 1163 and 1166 m as well as between 1837 and 1877 m. Additionally, incidents of stuck pipe occurred and fishing operations were necessary. The maximum temperature estimated using fluid inclusions from a depth of 2980 m was approximately 400 °C. The well was eventually plugged with cement plugs and abandoned (DOGGR online well records 1982). During drilling the KS-13 geothermal well in 2005 at the Puna geothermal field in the Kilauea Lower East Rift Zone in Hawaii, magma was unexpectedly intersected at depth of 2488 m causing an increase in torque values, and around 8 m of well was lost. Many attempts to clean the borehole made only insignificant progress. Several kilograms of glassy cuttings were circulated out of the hole indicating that the dacite magma was intersected. During reaming operations, the drill string became stuck at 2253 m and the well had to be abandoned due to the low probability of successful recovery. Unfortunately, direct well temperature and pressure measurements are not available and only the temperature of dacite magma of approximately 1050 °C is known (Spielman et al. 2006). The well served as a primary injector at the Puna geothermal field with a wellhead pressure of approximately 29 bars (Teplow et al. 2009) with a perforated liner pipe at 2124 m until it was overwhelmed by basalt lava, which erupted from the east Kilauea rift zone in May–June 2018. Very little information is available from the IID-14 geothermal well drilled to a final depth of 2073 m and experiencing well temperatures of 390 °C (measured using wire-line logging tool at the well bottom) in the Salton Sea geothermal field. The driller reports stated that the well was uncontrollable with fresh water as a killing fluid (DOGGR online well records 1990). To allow for safe fluid production and problem-free drilling into the supercritical geothermal resources improvements of currently used technologies for drilling and well completion, adhered from the petroleum industry, are necessary. This section is divided into five subsections, i.e., drilling technology, drilling fluids, cementing operations, wellhead and casing materials and logging technology and describes potential solutions and already made improvements in particular drilling projects to accommodate differences and challenges of wells investigating supercritical resources. Common to geothermal areas are hard, volcanic, abrasive, nonhomogenous and heavily fractured rock formations which are prone to circulation loss, increased tortuosity, heavy dog legs, high tool wear and low rates of penetration. Conventional drilling tools such as tri-cone tungsten carbide insert drill bits have proven performance to approximately 180 °C, whereas directional drilling systems to temperatures up to 225 °C (Stefánsson et al. 2018), which is not sufficient for drilling into a supercritical resource. With conventional mechanical drilling technologies, penetration rates between 1 and 6 m/h are obtained, meaning that rock breaking and removal should be greatly improved to reduce the cost of deep drilling. Developing technologies such as metal-to-metal sealed drill bits and directional systems, hybrid bits, mud hammers or non-contact and wear-free technologies such as laser, plasma or electro-impulse drilling might allow for much faster and problem-free drilling for supercritical resources. Extreme temperatures of circulating drilling fluids promote damages to any elastomer parts within downhole drilling and completion equipment. This eliminates the possibility of using most types of cementing, directional drilling equipment and conventional drill bit technology. During the Venelle-2 drilling campaign, a special type of PDC bit without any elastomer parts was used. This kind of ‘all metallic’ bits is able to operate under extreme temperature conditions. The above-mentioned drill bit technology obtained good results in terms of drilling progress and durability (Bertani et al. 2018). In the IDDP-2 drilling campaign, high-temperature tri-cone rotary drill bits and a hybrid drill bit rated for drilling fluid circulation temperatures of up to 300 °C with a specially designed high-temperature grease and metal-to-metal seals were used for operations. Both proved to function without major problems and provided sufficient penetration rates and bit life (Stefánsson et al. 2018; Chatterjee et al. 2015). 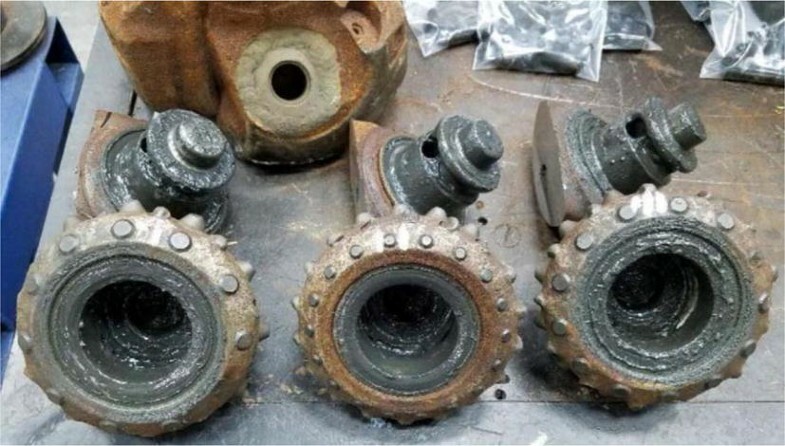 Figure 6 presents a state of high-temperature drill bit parts, such as cones and bearings, after exposure to extreme temperatures in the IDDP-2 well. During the IDDP-2 venture, together with temperature-resistant drill bits, a prototype of an elastomer-free directional drilling system with metal-to-metal seals, intended for EGS application with an aggressive fluid environment and high-temperature downhole conditions (up to 300 °C), was implemented (Chatterjee et al. 2015). The evaluation made after consecutive bit runs with the mentioned metal-to-metal directional drilling system, proved wear of rotor and stator; however, the power section was still operational and provided torque values according to manufacturer’s specifications (Stefánsson et al. 2018). In general, the prototype of a directional system for geothermal wells up to 300 °C proved to work successfully during the IDDP-2 drilling operations (Friðleifsson and Elders 2017; Friðleifsson et al. 2017). New wear-free and contact-less drilling technologies are being currently developed at various institutions around the world. The thermal drilling methods include flame, plasma, spallation, laser, and quasi-thermal electro-impulse drilling technology. Thermal energy is used to weaken the hard rock and create spalls. Subsequently, the spalls with weakened rock are being later mechanically crushed and circulated out of the hole. Efforts within different thermal drilling technologies are ongoing in research institutions in Germany, Slovakia, and Switzerland. Another group of new technologies includes fluid-assisted drilling with high-pressure water jets. This technology is being currently researched e.g. in countries such as Germany and Austria. Additionally to the uncertain behavior of drilling fluid under extremely high temperatures, one of the main problems during drilling exploration wells is uncertainties related to pore and fracture pressures and potential over-pressurized zones. This problem was resolved in the Venelle-2 campaign by Managed Pressure Drilling (MPD) system with a rotating circulation device (RDC) and Coriolis’s flow meter, which is mostly used in depleted oil and gas reservoirs with severe circulation losses (Bertani et al. 2018). MPD systems allow maintaining well pressures slightly higher than the pore pressure, which might be a potential solution for maintaining constant downhole pressures in high-enthalpy geothermal boreholes, preventing differential sticking and allowing for much safer and more efficient drilling in severe circulation loss zones. Unfortunately, MPD systems cannot guarantee well control but rather, enable to provide constant monitoring of bottom hole pressures and flow rates. This helps to evaluate in a real-time variation of downhole conditions and keep the downhole pressure balance within a certain range. Installed Coriolis flow meter is able to detect any difference between flow in and out, whereas through RCD choke valves are controlled and surface back pressure is being regulated. The main task of a drilling fluid during geothermal drilling is to maintain the stability of a wellbore, provide pressure, enable cooling of the downhole environment and drilling equipment and clean the borehole from cuttings. 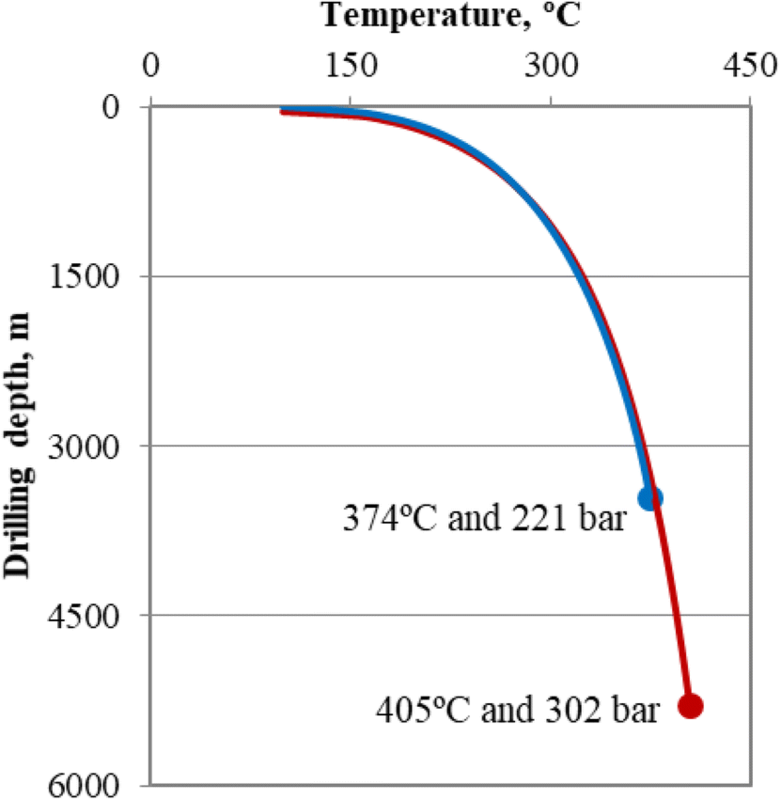 Commonly used bentonitic drilling fluid after exposure to temperatures in the range between 150 and 200 °C (Otte et al. 1990) experiences a sharp increase in the viscosity which might result in stuck pipe incidents. Bentonitic drilling fluids are preferred only for uppermost well sections, where formation collapse is expected and where temperature gradients are not as high. Commonly used polymer additives available at the market today are limited to circulation temperatures of approximately 90 °C (personal communication with Alexander Buchner). One of the main concerns of drilling, especially in over-pressurized zones, is exposing the drilling fluid to high-temperatures, especially during long periods of drilling stoppage, and simultaneously degrading its properties. In projects such as the IDDP-2, constant total losses throughout drilling operations and highly fractured rock formations (Friðleifsson and Elders 2017; Friðleifsson et al. 2017), resolved the problems connected to the degradation of drilling fluid properties and hole cleaning, as only clean water with polymer pills were used as drilling fluid and all created cuttings were lost in the heavily fractured geothermal reservoir. This phenomenon enabled reaching depths of nearly 4700 m. Different conditions were encountered during the drilling of the Venelle-2 well, which resulted in the usage of a water-based drilling fluid system with ilmenite and sepiolite as drilling suspending agents to resist high circulating temperatures and eliminate the risk of sagging. Selection of the drilling fluid in the Venelle-2 well proved to be successful but, however, caused challenges during implementing standard well control procedures (Bertani et al. 2018). Improvements are needed for drilling fluids being able to maintain their properties at much higher temperatures as well as aid cleaning operations, providing good cooling capabilities and above that being environmentally friendly and biodegradable. Authors do not know about any currently undergoing research for thermally stable drilling fluids especially designed for supercritical geothermal resources. One of the crucial operations during drilling wells exploring supercritical resources is the primary cementing operation. Cement blends have to not only withstand high-temperature gradients during placement, drilling and fluid production but also resist cyclic loading during situations such as well stimulation, production kick-off or an undesirable event of well quenching with cold water. The conventional cement mixture based on Portland cement G or H class with addition of between 35 and 40% of silica flour has a proven performance in conventional geothermal wells (Kosinowski and Teodoriu 2012), where temperatures of produced fluids are below 350 °C. The Ordinary Portland Cement (OPC) experiences strength retrogression as early as at 110 °C, after which a rapid decrease of compressive strength and chemical resistance and increase in permeability is seen. To provide good thermal as well as corrosion resistance, improved cement mixtures are necessary. These blends must ensure higher ductility of hardened cement and might include non-Portland mixtures such as geopolymers or calcium phosphate sealing systems, lower-density cement blends (e.g., foam cement) which have proven higher cement ductility and lower probability of rock fracturing during cementing operations. Another option includes adding plasticizers such as liquid latex to the conventional cement mixtures to create more ductile sealing system. The Venelle-2 well can be regarded as a successful use of non-Portland cement blend in geothermal well exploring supercritical resources. The cement mixture, designed for boreholes experiencing well temperatures in excess of 450 °C, was used for all 7″ sections of the well and also for the temporary abandonment job and up to now, there have been no registered problems related to the cement job quality (Bertani et al. 2018). Investigation of improved cement blends generating lower pressures and enhancing casing protection, assessment of cement quality from the IDDP-1 well, as well as strain and temperature measurement in cement sheath are being currently studied within the GeoWell7 (H2020) project. Not only cement mixtures but also improvements of cement placement method for primary as well as remedial cementing jobs are necessary. Stage cementing methods do not satisfy conditions of wells exploring supercritical resources, which are drilled very often in zones of partial to total losses of drilling fluid and in extremely high thermal gradients. The most suitable cementing method has to allow for continuous cementing to achieve full sealing of any existing and newly created fractures during cementing and ensure a good bond between casing and rock formations. It is usual to pump much more excess cement in a high-temperature geothermal well than it is required for a petroleum or a natural gas well. Common cementing procedures include stage, inner string, reverse circulation, tie-back, lightweight cementing and annulus packer method, which are presented in Table 2 together with their advantages and disadvantages. In recently drilled high-temperature wells, where cementing jobs at greater depths, possibly in loss circulation zones, are needed, the reverse circulation cementing method is being more commonly applied (e.g., the IDDP-1 and IDDP-2 wells in Iceland or the Habanero-4 well in Australia) (Friðleifsson and Elders 2017; Friðleifsson et al. 2017). Results of various research on cement blends in geothermal and petroleum wells proved the inadequacy of selecting the wellbore cement blends based solely on the compressive strength requirement of minimum 6.9 MPa and permeability of at least 0.1 mD throughout exposure of 12 months to the downhole environment (API Task Group 1985). It was proven that even high compressive strengths of cement do not guarantee zonal insolation (Philippacopoulos and Berndt 2002). Such studies have emphasized the influence on wellbore cement stresses of elastic properties of cement and rock formations such as Poisson’s ratio, Young’s modulus but also thickness of casing and cement as well as applied wellbore, far-field stresses and temperature. Cement sheaths were so far regarded as a decoupled system. This is a rather simplified assumption and is not sufficient for the extreme condition of geothermal wells exploring supercritical resources, drilled in tectonically active regions with extremely high temperature and pressure gradients. For future deep drilling ventures, it is needed to look at wellbore cement as a coupled system together with the influence of casing and rock formations. It is needed for a cement design to assess influence of stresses imposed on cement sheaths during well’s lifecycle (i.e. drilling, maintenance, production kick-off, fluid production), as well as in situ stresses and temperature effects. Only such detailed analysis will help to select the proper cement design and predicted cement sheaths stresses for particular high-enthalpy geothermal field (Teodoriu 2015). A research on integrating wellbore acoustic measurements with an analytical model of cement sheath stresses in coupled casing–cement–rock system for improved cement damage prediction is being currently ongoing at International Geothermal Centre. Casing materials used in the geothermal industry have not changed for decades and involve either conventional API K-55 or in some cases L-80 steel grades. New inexpensive materials, that are corrosion resistant and able to withstand high thermally induced static and cyclic loads, are of high interests in the high-enthalpy geothermal industry (Kaldal et al. 2015, 2016). Some of the potential materials which might possibly be used in wells with temperature conditions above critical include stainless steel, nickel-based alloys, titanium steels and composite metallic materials (Þorbjörnsson et al. 2015). These are, however, rather expensive and will put an immense load on the investment costs of the project. Another, interesting concept is the method of cladding the casing strings with corrosion-resistant layers. Such technique is already being used in the wellhead assembly parts of wells such as the IDDP-1 and 2 (Þórhallsson et al. 2014, Friðleifsson and Elders 2017; Friðleifsson et al. 2017). Cladding might improve the corrosion resistance of the conventional steel grades used in the geothermal industry and decrease the price relative to strings being made exclusively from expensive corrosion-resistant materials such as titanium. The main scope of the newly kick-started Geo-Coat8 international project is to develop specialized corrosion and erosion resistant coatings for variety of geothermal infrastructure components including casing strings, based on high entropy alloys as well as ceramic and metal mixtures to ensure the required bond strength, hardness, chemical resistance and density for the challenging geothermal applications. The casing string design has to follow the assumption of extremely high temperatures and highly corrosive and hostile, especially to the mechanical infrastructure, geothermal fluids, often with high concentrations of H2S, which might potentially lead to sulfide stress corrosion. In order to avoid casing failures, selection of casing strings directly exposed to the reservoir fluids (most commonly a 7″ liner pipe and a 9 5/8″ production casing) should be limited to casing materials designed for sour conditions. These steel grades include for instance API L-80 and T-95. In recent years, improved casing material such as TN80-3%Cr with lower corrosion rates is being employed for production casing string and liner pipe in the Los Humeros geothermal field due to the influence of hostile geothermal fluids from greater depths (Diez et al. 2015). The TN125SS casing material from the Venelle-2 campaign was selected, due to its elastic behavior with the compression load, which is the governing load. Although TN125SS is not designed especially for sour conditions, it could be used in the presence of H2S with reservoir temperatures higher than 80 °C (Bertani et al. 2018). Similarly to casing material, casing connections have to withstand high thermally induced loads. Due to extremely high thermally induced cyclic stresses, it is believed that both conventional API buttress and premium casing couplings will experience failure in wells investigating supercritical resources. Extensive research is currently being carried out within the frameworks of GeoWell and DEEPEGS project focused on the development of flexible couplings for high-enthalpy geothermal wells (Kaldal et al. 2016). This new solution will allow for axial movement of casing strings (as bends are not possible in a vertical wellbore) to avoid coupling rupture due to periods of heating (thermal expansion) and cooling (high tensile forces due to contraction of steel) during maintenance work and should avoid generating stresses above yield strength of the casing material and reducing likelihood of casing collapse. During running casing, couplings will be in open mode. While heating up, the casing material will expand allowing for each coupling to expand freely downwards via a slip-joint and closing the system before reaching the expected temperatures, with enough residual axial force to seal the connection. To accommodate extremely high temperatures and seldom corrosive and hostile reservoir fluids, the wellhead assembly has to be diligently selected. The choice should be a compromise between wellhead quality, cost, and safety requirements. All wellhead implemented into geothermal wells have to follow API and ASME regulations. The wellheads used for both IDDP projects were ANSI class 1500 master valves with ANSI class 2500 flanges, whereas the wellhead employed for the recent Venelle-2 project was API class 10,000 rating (Bertani et al. 2018; Friðleifsson and Elders 2017; Friðleifsson et al. 2017). In the Venelle-2 well, the base flange was realized with high corrosion resistance material. In both mentioned projects, steel cladding was realized on some parts of the surface valves and spools potentially exposed to aggressive reservoir fluids. The most important parameters obtained from any geothermal well are temperature and pressure measurements. Currently available tools allow recording temperatures with a maximum of 350 °C and 4 h of operation time. A reliable system of temperature recording at extreme temperatures in a geothermal well was, however, yet not developed. As of today, several research projects focused on developing logging technologies for wells with extreme temperatures. One of these projects, HITI (High-Temperature Instruments for supercritical geothermal reservoir characterization and exploitation) developed a temperature logging tool for well conditions reaching the critical point of pure water (Ásmundsson et al. 2014). Another project was initiated during the Venelle-2 drilling venture to develop a temperature and pressure logging tool being able to withstand a temperature of 450 °C, which is much lower than temperatures actually recorded in the Venelle-2 well, and exposure to the operation time of minimum of 6 h. The design of the mentioned tool is based on logging to an internal memory system and is powered by batteries resistant to high temperatures. Metal seals used in the tool are rated for 650 °C and measurement accuracy is 5 °C and 0.5 bars (Bertani et al. 2018). Additional temperature measurements were installed during the IDDP-2 campaign on the outside of the production casing string during running in operations. Installed at various depths between 341 and 2641 m, eight thermocouples and a fiber optic cable were expected to enable continuously measure strain, acoustic noise as well as record temperatures during drilling and future fluid production as well as to evaluate the quality of casing cementing operations. Thermocouples installed in the IDDP-2 well ceased to transmit temperature data after some time, even though casing was not exposed to temperatures higher than 100 °C. The condition of the fiber optic cable is yet not known, as it will be used after the IDDP-2 well is heated up (Friðleifsson and Elders 2017; Friðleifsson et al. 2017). Temperature measurement methods in wells exploring supercritical resource vary from well to well, with direct temperature measurements such as wire-line logging to more indirect methods such as fluid inclusions, melting materials or estimating magma temperature. In some cases, temperature measurements were carried out inside the well, not necessarily at well bottom, during drilling fluid circulation and in other, directly at the wellhead assembly during fluid production. Information about pressure conditions was unfortunately not accessible for all of the studied wells. Future supercritical projects might find it rather difficult to assess thermal recovery data from the wells exceeding the critical point of reservoir fluids in order to establish undisturbed pressure and temperature conditions of the geothermal reservoir for further modeling activities. As experience from past campaigns has proven, such data will be normally assessed using a variety of different measuring techniques and will provide a range of temperature and pressure values. Defining failure modes for studied wells proved to be difficult, due to the lack of detailed data, published well reports and literature available and authors had to base their knowledge on a small and limited amount of published data. From the 20 drilling projects presented in Table 1, drilled in or close to supercritical conditions, failure modes are known only for a few wells. In most cases, failure of the geothermal well was caused by excessively high thermally induced stresses exerted upon the casing string and couplings during operations such as well quenching or production kick-off causing casing collapse and/or connections rupture. Casing collapse in some cases might have been also propagated by bad cementing job commonly executed in zones of partial or total circulation loss. In few wells, blow-out or near-blow-out conditions were encountered, which in most cases precluded further drilling due to safety concerns. In older wells, not aimed to penetrate the supercritical resource, such as KJ-39, NJ-11, KS-13 or San Vito-1, the well design was not rated for such extreme temperature and pressure conditions and well completion was finalized at much shallower depths. Some of the mentioned wells, after reconstruction work, serve today as injection wells. In other wells, investigation of deeper supercritical resources had to be halted due to safety reasons of ejection of hostile gases, such as H2S, which might have promoted damages to the mechanical infrastructure as well as cause health and life danger. The heavy precipitation, corrosion, and erosion due to high flow rates of hostile and oftentimes hypersaline geothermal brines are also noted as serious issues, especially during fluid production and well testing. Recently undertaken European initiatives investigating supercritical geothermal resources greatly improved state of knowledge in regards to the drilling technology, drilling fluids, cementing operations, wellhead and casing materials and logging technology for high-temperature wells going beyond what is considered currently as a standard in the geothermal industry. It was with their help that development of new equipment and downhole tools was possible and areas of potential improvement were emphasized. It would be beneficial for mitigating challenges and improving the learning curve for wells investigating high-temperature geothermal reservoirs, to establish a dialog with the petroleum industry where scientist and engineers can cross-fertilize experiences and ideas, which could be valuable for upcoming supercritical projects. The biggest potential technology transfer could be possible for thermal enhanced oil recovery industry researching steam-assisted gravity drainage and cyclic steam injection methods. Stuck pipe—a situation during drilling operations, where a drill string cannot be moved vertically or rotated. It is usually the result of differential sticking. Fishing—an operation of removing any type of debris or junk from the wellbore with use of a special equipment or methods. Whereas ‘fish’ is any type of tools or equipment (especially lower parts of bottom hole assembly) accidently left in the well during drilling operations. Ideas for this paper evolved after MK’s poster presentation during 5th European Geothermal Workshop—Characterization of Deep Geothermal Systems on 12th and 13th of October 2017 in Karlsruhe, Germany. MK wrote the first draft of the paper and then its journal version, which was later reviewed by VW. Both authors read and approved the final manuscript. Authors would like to thank Thomas Reinsch from the GFZ German Research Centre for Geosciences, Gunnar Skúlason Kaldal from the Iceland GeoSurvey, Sverrir Þórhallsson from the Keilir Institute of Technology for their knowledge, support, and constructive criticism and conversations during the preparation of this paper. Authors would like to thank Dimitrios Mendrinos from the Centre for Renewable Energy Sources and Saving for sharing his experience regarding Greek geothermal expeditions in Milos and Nisyros and Egill Juliusson from Landsvirkjun for sharing his experience from the KJ-39 well in northern Iceland. Authors would like to also express deep gratitude to the late Ruggero Bertani from the ENEL Green Power for sharing his experience from the Venelle-2 deep drilling campaign. Many thanks to Florian Hahn from the International Geothermal Centre in Bochum for thoroughly reviewing the paper. Authors would like to also thank the three anonymous reviewers of this paper. Authors would like to thank CFE for cooperation and received data from the LHGF, without which this research would not be possible. Authors would like thank CFE in Morelia, especially to Marcela Sánchez Luviano and Miguel Ramírez Montes, for cooperation and constructive conversations during the preparation period of this paper. This work was carried out in the framework of the GEMex project, which received funding from the European Union’s EU Horizon 2020 research and innovation program under Grant Agreement No 727550.